"A stunning and epic cinematic odyssey that will blow you away!" Venture into a land of action fantasy, heroic battle scenes and visual wonder in Snow White and the Huntsman Extended Edition, coming to Blu-ray Combo Pack, DVD, On Demand and Digital Download, from Universal Studios Home Entertainment. Packed with pulse-pounding battles, unmatched visual imagination and compelling characters, Snow White and the Huntsman is a wholly original adventure story told on an epic scale. 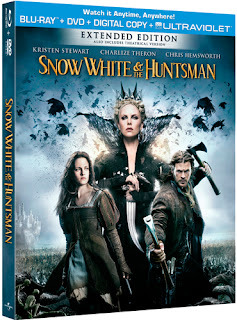 From the splendor of the wicked Queen's enchanted palace to the menace of the Dark Forest, a breathtaking combination of harrowing beauty, epic battle scenes, visual wonder and jaw-dropping special effects make this film singularly suited for the incomparable high-definition picture and perfect hi-def 5.1 surround sound of Blu-ray. I have loved both fantasy movies and fairy tales for as long as I can remember. Movies that take you on a journey to a distant land can be an escape from the sometimes slightly less that glamorous world in which we live. If the world is a fairy tale that we already feel familiar in, our escape can be that much better. 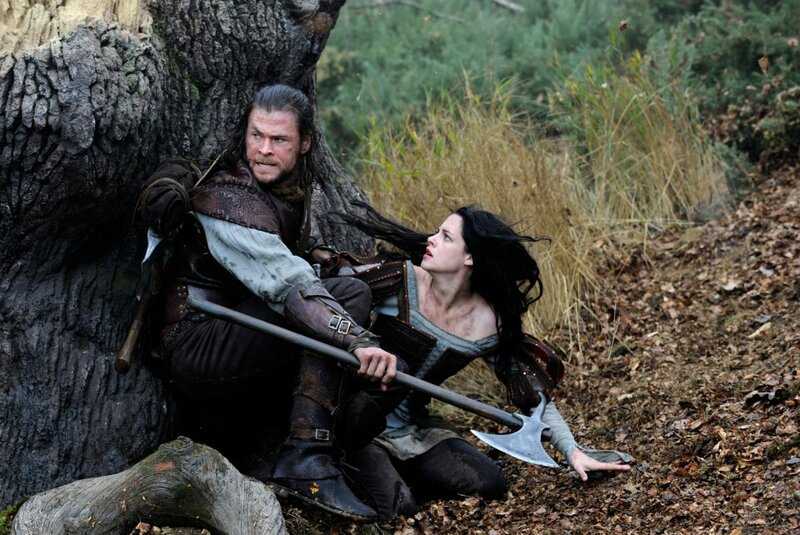 Snow white and the Huntsman accomplishes this in rare fashion. This movie is as much for adults as it is teens, but I don’t know if I would recommend it for younger kids. I will go ahead and say that, though there isn’t an overabundance of blood, things like violence, murder, poisonings, and deceptions are present throughout the movie. With that small “disclaimer” out of the way, I’ll move on to what I loved about the movie, which is pretty much everything else. Before you even consider the plot, it is obvious this movie has the potential for greatness. Kristen Stewart does an excellent job of portraying snow white. Chris Hemsworth gives a display of acting that closely rivals his role as Thor. Of course, Charlize Theron has more acting experience than both the former combined, and it shows. She assumes the role of the evil witch, steeling younger women’s beauty and leaving them prematurely aged and broken. She does a magnificent job. For someone known for being beautiful, she will make your skin crawl in this film, and you will hate her character and love her acting at the same time. I won’t get into the plot, but it isn’t just a modern re-make of Snow White with real people. There are plenty of storyline changes and twists. For a Disney movie, the original was somewhat dark, that has returned much amplified in this installment, as have the dwarfs. They show up about halfway in. There is quite a bit of action to be had, but the movie did feel like it could have had one or two more scenes of that type. A short lived love triangle seems to begin to grow, but never really evolves beyond a would be kiss. Much of this movie will appeal more to women, but their partners should be able to stomach the fluttery stuff for the action that lies between those scenes. The storyline really works, the ending was satisfying, and the production value, music, and direction of the movie are all very top of the line. Much of the camera work reminds me of the Lord of the Rings trilogy. This is a good thing. This is a great reinvention of a great classic story, and deserves not to be missed as much as you deserve not to miss it.